Thanks for visiting our Arlington, Illinois property damage restoration information page. Our company, A-Emergency Services and Restoration, is the premier home restoration resource in Cook County, so you are working with the best when you engage our services. This historic city has a very distinct character of its own, but it is perfectly situated with easy access to everything that Chicagoland has to offer. From the Bayside Drive/West Rand Road area to the South Meier Road/West Lincoln Street section and everywhere in between, for property damage restoration in Arlington Heights, IL, you can’t go wrong with A-Emergency Services and Restoration. If you have been the victim of a fire, you are looking at one great big mess. It can be hard to know where to begin, because it is very likely that this is something that you have never experienced before. We are in business to fill this gap for our neighbors here in Arlington Heights, Illinois. Fire damage cleanup is our area of expertise, and we also handle all the fire damage restoration and smoke damage restoration chores after the debris has been removed. When necessary, we can install roof tarps, and we also do board up work and glass replacement to complete the job. In addition to our fire damage clean up and fire damage restoration services, we also have extensive water damage clean up capabilities. If you have flooding from an external source like a storm or an internal flooding issue, we can provide a rapid response. Plus, we are always on call, 24 hours a day, seven days a week. Once the water damage has been cleaned up, we can subsequently put our water damage restoration skills to work for you. 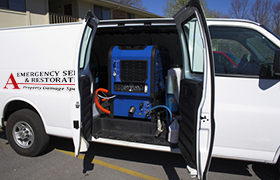 Speaking of water damage, in these situations, mold can begin to grow, and we are fully capable of providing mold removal and remediation services. The property damage restoration expertise that we apply in the field is second to none, and we have built our business on the quality of our work. At the same time, we also provide excellent customer service every step of the way. We will even communicate with your insurance company for you so that you can be sure that you are doing all the right things to take full advantage of your coverage. Whenever you need us, at any hour of the day or night, you can reach one of our Arlington Heights, Illinois home restoration specialists by phone at 866-902-6273.